The Red Series BRLSPKLHW universal speaker trolley bag fits many of the larger 15" molded speakers on the market such as the JBL PRX615M and EV ELX115/115P. 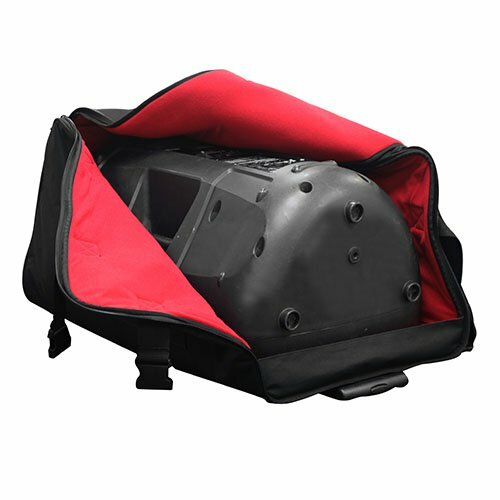 The durable black exterior made of ballistic nylon complements the soft polyester blend red padded interior making it the perfect bag to store and transport your valuable gear, protecting it from unsightly scratches. Keep your speakers looking sharp at gigs where projecting professionalism counts. Other Red Series non-trolley speaker bags are available from a small size (BRLSPKSM), a medium size (BRLSPKMD), up to a large size (BRLSPKLG).